In the beginning of 2016, Dr. Michael Skaggs, NAMMA’s Director of Programs, began exploring port levies and voluntary contributions for seafarers’ welfare. 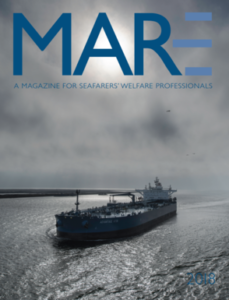 The results of our research, now published in a final report, point to a stark financial future for seafarers’ welfare providers without the active support of port authorities and terminal operators. In this research we have learned that port authorities and terminal operators are the most important actors in the port levy arrangement, even though they are neither the source nor object of funding. With a minimum of effort and resources, they stand to accomplish an enormous amount of good. By “port levies,” we use Dr. Olivia Swift’s term from her 2013 global survey commissioned by the International Seafarers’ Welfare and Assistance Network: small fees that visiting ships are asked to pay toward the support of seafarers’ welfare. While the word “levy” suggests a mandatory contribution, in North American ports they are almost always voluntary. What seafarers’ centers manage to do on tiny budgets is remarkable. They transport seafarers to a variety of locations ashore; they provide communication facilities and equipment; and most importantly, they offer a warm welcome to seafarers who are grateful for a few hours off the ship and the chance to connect with friends and family from whom they have been isolated for quite some time. A few statistics help visualize our research. First, the majority of centers receive little assistance from port levies—of the 69 centers contacted, approximately half have a port welfare voluntary contribution in place at this time. Further of that half, most realize less than 15% of their operating budgets this way. This is one part of a web of funding, but other routes are not any easier. Commercial models are not viable solutions: Since our goal is to provide all we offer as cheaply as possible or freely, there is rarely enough margin to cover expenses. Charitable contributions from outside the port community are helpful, but also insufficient by themselves. The remove at which the shipping industry operates from the general public means that seafarers’ welfare often is as hidden an industry as seafaring itself, and fundraising is extraordinarily difficult. And while many port authorities generously contribute to the infrastructure needs of seafarers’ centers, the liquid resources necessary for daily operations frequently outpace the funding that centers rely on. We emphasize that in-kind support from the ports in which centers are located – subsidized rent, utilities, maintenance and capital costs, and so on – cannot be overestimated in its impact. Without this type of assistance from port authorities, many seafarers’ centers would simply cease operation. Second, while centers expect about half of their requests to be returned, 20% is a more common rate. Income streams from cash contributions remain a desperately-needed solution, and one which port authorities are uniquely positioned to address. In fact, our survey found that the single greatest indicator of a center’s financial success through port levies was a productive relationship with port authorities willing to help publicize the good work of the centers and relay to shipping the importance of the services provided by these centers. In one case, a port authority even pays a levy to the seafarers’ center for each ship that calls; whether the owner then pays the port authority or not, that port authority recognizes the value of the seafarers’ center. Finally, the amounts requested are typically minimal, with most centers requesting $100 or less. We thus offer two recommendations to support the work of seafarers’ centers. First, we encourage those in port authorities and shipping to get to know the seafarers’ centers that operate in their ports and terminals – their origins, their missions, their staffs, and their volunteers. Ask if they could use a port authority or terminal operator representative on their board. Schedule regular meetings or luncheons for information and advice exchange. The key factor for those centers that have a high rate of return is relationships—relationships between the center and the port or terminals, between the center and agents, and so forth. Port authorities and terminal operators sit at the nexus of all these relationships. Second, if your port has a levy in place, review how it is collected and distributed. How many ships pay? What might contribute to high or low rates of payment? If your port does not have a welfare levy, why not? What obstacles stand between the present omission and a future levy? Starting a port welfare levy, or improving one already in place, is guaranteed to improve seafarers’ centers’ bottom lines and will evidence a maritime community that prioritizes the care of its laborers.